This plan covers North Worcestershire and parts of Shropshire and Staffordshire. The draughtsman used different shades of green wash to distinguish woods, meadows, commons and parks. 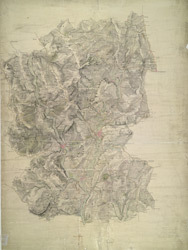 The Severn Valley extends down the left-hand side of the map, with the royal hunting forest of Wyre depicted at middle-left. To the right of the sheet is the Stour Valley, with the Staffordshire and Worcestershire Canal following the river valley. Rising above the two valleys is the ancient settlement of Kinver Edge, with its outcrops of red weathering sandstone formed in the Triassic age.